Oh wow, has it already been 3 months? I have come to a decision lately. I had been thinking about it for a long. Since Félix was born actually. I am a graphic designer, been self-employed (and doing well) for over 8 years now. When Félix was born, I took 5 weeks off work. Then I had to go back to work (at my home office, but still) so I wouldn't lose the clients I had been working hard to keep. But I worked less. I did not accept any contract that would come my way. I was way more selective and that was ok. When I got pregnant with Laurent, oh my god was I tired. Taking care of a toddler, a house, a huge belly and working on top of that, well, it was too much for me. But to stop working for a year would mean to lose all my clients and contracts. To stop working for many years would mean having to reorient myself in a couple of years, because the graphic design world moves too fast. You can't stop for a few years and then expect to start off where you left. So I kept working because I wasn't ready to stop designing altogether. I wasn't sure I wanted to star a new carreer in a few years. And then, Laurent came into our lives. And I had to work when he was only 5 weeks old, again, because of this one big contract I have and love (the only one I still like, in fact). I did it. It was hard. Félix went to daycare a little bit more for 2 months (3 days a week instead of 2). I worked nights and weekends. But I made it. And it opened my eyes. It helped me make my decision. I am only keeping this one contract from now on. It comes only twice a year, for 6 weeks each time. I still enjoy doing it, no matter how hard it is. But for the rest of the year, I am a full-time stay a home mom. I don't care if I become outdated. I'll stop working completely then. If I want to start working again in a couple of years, when the kids are in school, we'll see then. Now, today, I am enjoying watching my kids grow. And wouldn't you know it, I seem to have even less free time now that I'm not working than I had before. But it's ok. Taking care of my two boys is the greatest job I could have hoped for. It is hard and not very glamourous. But I love it nonetheless. Not working also means having more time (supposedly) for things I enjoy doing. I have been a support mom for a breastfeeding support group for over a year now. And I have been writing for a webzine about infertility (in French) for a year. Things I wouldn't have time to do if I was working. Financially, we're lucky P has a really good job (and he works damn hard too) so I can stay at home with the boys. I know P is grateful I am willing to sacrifice my carreer to be there for the kids. And I know he kinda knows it's hard, even if he will never trully know how hard it really is. But no matter how hard it is, I would never trade my place with his. The first two months with Laurent were actually real hard. Laurent had colics and cried for 3 hours straight. every. night. No matter what we did, he cried and fussed and seemed really unconfortable. I tried everything I could think of or find on the internet. He finally snaped out of it a couple of weeks ago. What a huge difference it made. He is a new baby. Always smiling and laughing and sleeping really well and most of all, going to sleep real fast. But for 2 months, I was a complete mess. He wouldn't sleep during the day either, except in the wrap. He wouldn't be put down. Ever. For two months. Even during the night, he would sleep in our amrs. Yeah, we totally spoiled him. I had no patience, no life, no sleep. I felt as if my brains were about to explode every time he cried. I felt useless and incompetent. I thought the second baby would be easier than the first. Little did I know. Félix was an angel compared to his little brother. And I felt very sorry for Félix who had to be very patient and understanding for a little boy. But now... now things are so great. Laurent sleeps in his bed, by himself, the whole night through. He goes to sleep after 5 or 10 minutes of rocking him. No more crying. Nurses like a champ. Kicks and giggles all the time. Grabs toys, eats his hands and lifts his head. He is so adorable and fat. He has so may folds, it's unbelievable! He weighed 9 and 12 at birth. At 3 months, he weighed 19 pounds. I tell ya, I am not producing milk, but 35% cream! Félix loves him. He can't wait for his little brother to come and play with him. He hugs and kisses him all the time. He screams with joy when he hears the baby waking up. He loves making him laugh and smile. He is such a sweet sweet boy. Getting so big too. Life is good. After a rough patch, it is good again. Oh so good. Last time I was here, I was wondering if my body would be failing me once again and if I would need to be induced, once again. It was with no suprise that my dr told me, on March 11, that everything was still firm and closed. He told me he would let me go past 41 weeks, but we would need to consider induction on the 19th. I was disappointed, but ok with the idea. I would meet my son soon, whatever the way he came out. On March 13, in the afternoon, I noticed some of my mucus plug on the toilet paper. I knew it didn't exactly mean I would go into labor right then and there, but at least I knew my cervix was doing "something". The next day, I lost more gummy stuff. What had been ordinary Braxton Hicks contractions became gradually a little bit more unconfortable. Nothing much, and not regular, but still, something was changing. By the end of that evening, I had more contractions. They still didn't realy hurt. I just had to breathe them through. They still were not regular, going from every 6 minutes to every 12 minutes. They even stopped when I took a bath or when I laid on my left side. So I went to bed, thinking I might be giving birth this weekend after all. While I was sleeping, I had some contractions, even though I was still laying on my left side. I almost didn't wake up, only breathing them through and going back to sleep every time. But the contractions became more and more unconfortable and frequent. I woke P up around 1 a.m. and asked him to time them. They were regular, 4 minutes apart. After 20 minutes like that, I took a hot bath, but it became worse. They became 3 minutes apart and soon, 2 minutes. They hurt like hell. I tried many positions, but the one I found more confortable (and still...) was standing up, hanging from my man's neck, on my tiptoes. My legs really hurt, my back was killing me. The contractions were coming every 2 minutes and lasting almost a minute each. Not much time left to catch my breath! Around 2 a.m., we called the hospital. The nurse told me that since it took me a long time for my first son (12 hours of contractions, 3 hours of pushing) and that since my dr told me I had no progress done last Tuesday, I should keep breathing through my contractions at home for another hour. I understood that it would not change anything if I were at the hospital, but I still wanted to go. We waited 15 minutes and called my dad so he could come watch Félix while we were gone. He arrived 20 minutes later. I was in so much pain, and just couldn't imagine what it would be like when my water broke. I had hoped to go natural, but right then, I had only one thing in mind: epidural. Sooner we got to the hospital, sonner I would be free from the pain. It took us quite some time just to get to the car, having to stop walking every time I had a contraction. The ride to the hospital was horrible. The road was very slipery, the weather was bad and every bump made my scream in agony. It felt as if my belly was full of water and went up and down with every bump (and anybody's who's been to Montreal knows there are lots of bumps in the roads). And since I was sitting down, I was unable to control the pain. The contractions changed. It now really, really hurt my back and legs. I felt like pushing, I couldn't breathe, I just sat there, screaming, holding the door handle and praying we would get there fast. P drove quite fast for the weather and passed a few red lights (made a quick stop) and we were finally at the hospital. Last time I checked the clock in the car, it was 3:05 a.m. We had to walk a long way before actually getting inside. It was freezing. We had to stop every 2 minutes because of the contractions. It must have taken at least 20 minutes before we arrived and I was directed to a bed and asked to put on a hospital gown. It was so hard to do, the contractions never seeming to stop anymore. The nurse was very impatient with me. When she finally checked me, she said "well, you're complete!" I was so surprised, I was sure I was only 4 or 5 centimeters. She said I couldn't stand up anymore because my water wasn't broken and the baby was still high. They rushed me to the delivery room. The dr ruptured my waters and asked me to push. In a way, I did not want to push. I thought it would take 3 hours as it did for Félix. I thought I would never be able to get that baby out, it hurt too much. But in another way, I just had to push. It felt good to push. So I did. And heard "the head is almost out!" Once again, I was so surprised. It burned, but nothing like I imagined it would. I felt my baby coming out of me. I felt it all and it felt very empowering, so very full of life. Three more pushes and my second son was placed on my chest, breathing, beautiful. 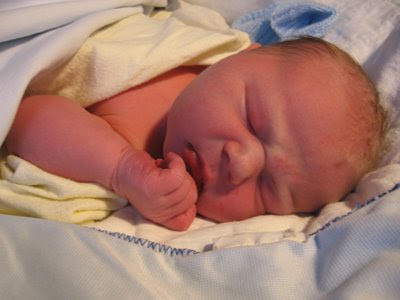 My son Laurent was born at 3:47 a.m on March 15. Very big and healthy. He weighed 9 pounds 12 ounces! It went so fast, so well, I just couldn't believe it. I kept saying to P I couldn't believe the baby was already there, that I had never hoped I could live such a wonderful delivery. Such a dream come true. Its been two weeks already, time flies by! Things are going well at home. Of course I am tired and missing a little bit the times when I actually had time for myself. But we are so happy. So, so happy. ... and still very pregnant. I can't blame baby2 for wanting to stay inside, what with the awful weather we're having and all. But man, am I impatient to meet him! Based on my last period, my EDD is March 11. Based on the u/s, it was moved to the 6th. But my dr uses the latest one, so for him, I'm not even late yet. Not that it matters a lot, but when you have a date in mind for many months and you finally see it getting near, you can't help but think you're going to be holding your baby by then. I would have liked to see at least some progress by now. At my appointment last week, my cervix was still firm and fully closed. I've been having Braxton hicks daily since 18 weeks, but they have done nothing. This last week: not one contraction, nothing. I would be very surprised if my dr tells me tomorrow that I am dialated, even at 1. I am starting to wonder if there is something else wrong with my body. Maybe it doesn't know how to start labor by itself? 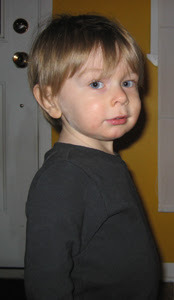 For Félix, I had to have prostaglandine gelly put on my cervix at 41 weeks because it was still firm and closed. Labor started later that day, but still, I needed something to tell my body it was time. I have a feeling something similar will happen this time. I don't really mind about the gelly. I am still not very open to an induction with Pitocin and stuff, but I could use a little help to get things started. I would be a little disappointed not to be able to do that part by myself either, but I know I would very soon get over it. I don't like regrets, especially over things I can't control. So that's it. I just though I should drop by to give some news. I'll keep you posted whenever the baby decides to come out! I remember when I used to come here often and write about my feelings. I remember when I was a (very small) part of this virtual community. I remember when I was infertile and longing to have a child. I also remember how, back in those days, I would read only blogs about infertility and/or adoption. My life was infertility. But today, I am miles away from the girl who started this blog 3 years ago. When I first posted in 2005, I never ever would have imagined that 3 years later, I would be sitting here, as big as a whale, expecting my second boy and celebrating my son's second birthday. It never felt quite right to be writing after I had Félix. I had started this blog to talk about infertility and it just felt weird to be talking about my son when so many women out there still struggled and hurt. It felt even weirder when I got pregnant with #2 so fast (even though it was with injectibles and pills). I just couldn't find the right words. So I stopped writing, but kept on reading. And I thought I owed an update to those out there who have been there for me. So here I am, 34 weeks pregnant and there's really nothing to say about this pregnancy. It's been tiring, but that's it. No pain, no sickness, no nothing. I am so excited to meet my second son in a few weeks. Nothing's ready, I didn't do any shopping, so I don't feel ready yet. But we're getting there. Félix doesn't seem to quite understand he is going to be a big brother, but he's starting to realise things are changing. And they will kep on changing for some time, becasue I am sure (even though I don't think I can even begin to imagine how much) life will never be the same after baby #2 enters our lives. As for Félix, the love of my life, he's turning 2 next week. I can't believe it's already been 2 years since I gave birth to my little blonde prince. He is such a joy. He talks a lot (although I seem to be the only one who can understand him), he's always smiling and playing and making me laugh. Well, not always. He has entered the terrible-two zone, but for the moment, it's really not that bad. He started going to kindergarten in December, 2 days a week. It's been going very well and it gives me time to work and rest. He is a very funny, very sweet little boy and I can't wait to see how good a big brother he is going to be. I will try and update more often. At least to tell you when I will have given birth. If I can find some time between entertaining a 2 year old and breastfeeding an infant. The last two months have been spent either sleeping, playing with Félix while trying not to fall asleep or in vacations. But yay, first trimester is almost over! Let the fun begin! 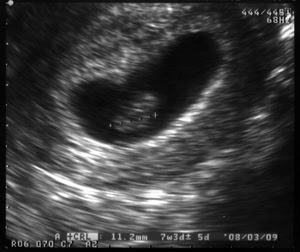 I had an ultrasound at 7 weeks to see if there was more than one in there. I felt there was only one, P. thought there were two. I must say it was a relief to see only one, but even more to see its little heart beating. Oh how I had been longing to hear that sound again! I've been feeling good, mostly. Very very tired and with Félix runing around, I can't just go to bed when I want to. I had no nausea whatsoever while pregnant with Félix, I was hoping to be that lucky again. I was still very constipated, which caused a little nausea at night, but quite mild. I guess I'm lucky when it comes to symptoms. It's strange how much this pregnancy is different from the other two. I cannot spend my days sleeping or gazing at my navel, wishing to see it pop or something. Having a toddler changes everything. But I still spend time gazing at my navel when I go to bed, at the end of the day. I remind myself there's a baby in there and that in a couple of weeks, I'll feel it kick and move around. I still can't believe this is happening to us. I'm expecting number 2. Me. It seemed too good to be true, I was always feeling as if something bad was about to happen. But as the weeks go by, I feel less and less afraid. 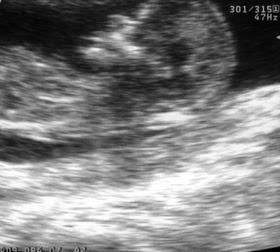 I had another ultrasound this week, the NT scan. Everything looks good. We saw the heart beat again, the little face with the tiny perfect nose, a little hand waving at us (my heart melted right then and there), a little brain. A perfect miniature baby. At 16 dpo, my beta was 405. At 18 dpo, it was 745. With Félix, at 20 dpo, my beta was 263. So I think I can say I'm. Pregnant. Me. Again. Wo.